Recent changes in the definition of the ICO policy on ‘cookies’ has created a situation where providing we advise you that we are using cookies, this website will load those we need and use for the running of the site. You will, on 1st arrival at the site have the option now to change this to suit your needs. If you don’t wish to accept cookies the notice bar will allow you to turn them off and this will remain so throughout the duration of your visit. Read more about this in our Cookies page. We use ‘session’ cookies to make the site function correctly during your visit. This is only active during the time you are on the site and whilst your web browser is open. Some of these cookies may persist for longer to facilitate any return visits you may make. 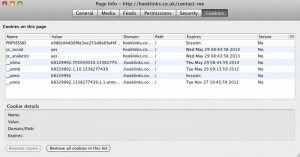 You have the ability to accept or decline cookies from arrival on the website and should you not Consent then the site will run without 3rd party cookies. Most browsers automatically accept cookies, but you can usually modify your browser settings to decline cookies. If you choose to decline cookies, you may not be able to sign in or use other interactive features of our sites and services that depend on cookies. If you do not make either choice, consent or decline and visit another page the cookies will remain loaded underthe ICO term of ‘implied consent’, it would be my hope that you would choose to consent. Hopefully with our reassurance that we do not wish to store any detail about you or store anything harmful in your web browser, you can accept any cookies and enjoy what the website offers. 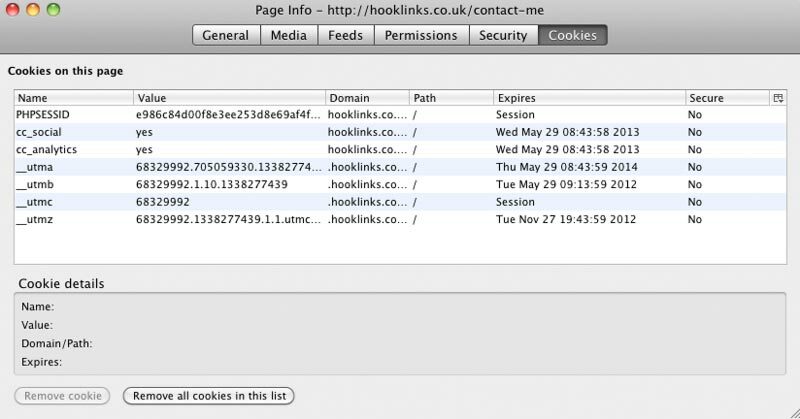 Please be aware that restricting cookies may impact on the functionality of the Hooklinks website. The following is a list of the cookies that may be implemented during your visit. Some of which are only applied by the system to run the website, there are no information cookies amongst these. Any Google Analytics or Social media cookies are only loaded on acceptance, but can be turned off.